MOSCOW, December 29. /TASS/. The possibility of a terrorist attack has not been discarded altogether yet, but there was no explosion on board the Tupolev-154, which crashed last Sunday morning near Sochi, the chief of the Russian Defense Ministry’s flight safety service, Lieutenant-General Sergey Bainetov said. "On the basis of the preliminary analysis of data retrieved from the cockpit voice recorder we have come to the conclusion that there was no explosion on board. But a terrorist attack is not confined to an explosion. There can be other causes, so this line of inquiry remains," Bainetov told a TASS news conference on Thursday. The only people who visited the Tu-154 plane during its refueling in Sochi were border guards of the federal security service FSB, Bainetov said. "All of the passengers boarded the plane at the Chkalovsky airdrome (near Moscow). In Sochi, only border guard service officials visited the plane for passport checks," he said. A Russian Defense Ministry Tu-154 bound for Syria crashed in the early morning hours of December 25 shortly after taking off from Sochi. There were 92 people on board the aircraft, including eight crew members and 84 passengers. Among them were journalists, servicemen and musicians from the world-renowned Alexandrov ensemble, the official choir of the Russian armed forces, who set off to celebrate New Year’s Eve with Russia’s Aerospace Forces at the Hmeymim air base in Syria. The Executive Director of the Spravedlivaya Pomoshch (Russian for Fair Aid) charity fund Elizaveta Glinka, known to the Russian public as Dr. Liza, was also on board the flight. The Defense Ministry said that debris from the Tu-154 aircraft was found 1.5 km off the coast of Sochi at a depth of 50-70 meters. 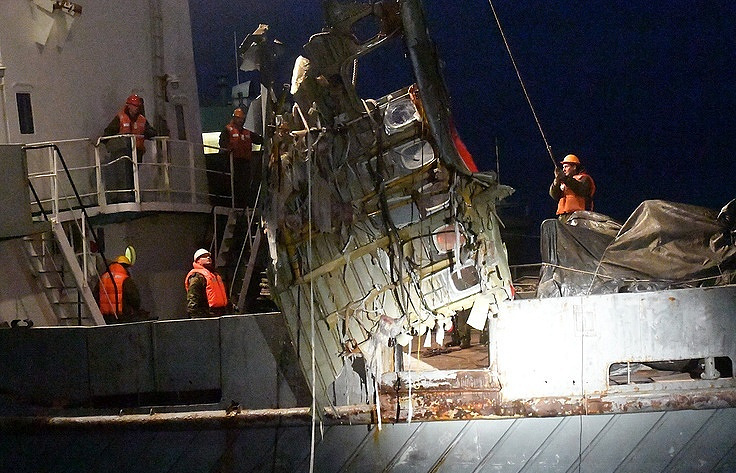 According to the latest data, a total of 19 bodies have been retrieved as of today from the Black Sea’s bed. 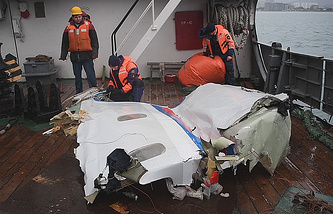 Russian Transport Minister Maxim Sokolov, who heads the governmental commission investigating the crash, said the terrorist attack was not a key suspected cause of the tragedy. On December 26, Russia’s Federal Security Service (FSB) reported the four main possible causes of the Tu-154 crash - foreign objects in the engine, low quality fuel, pilot error and technical malfunction.